Number of glasses of wine consumed: 4. No, 5. Maybe 7. Number of hours spent in the water: Not nearly enough. Number of times we laughed with cousins: I can’t count that high. This was a great trip. Truly. For being a two-year-old with a raging head cold who hates being in the car for any length of time, Benjamin did great. We had a minor issue on the way home when the portable DVD player ran out of battery charge (because I forgot to recharge it before coming home – see number of glasses of wine above –) but a quick stop to Wal-mart in a small Texas town fixed that right up. Swimmy and Benjamin got to spend time with some adorable cousins (who are so adorable I fear for the female population when they get older as they will be powerless against their gorgeousness. Seriously. These boys are gonna get a whole lotta, uh, action when they’re older.) But for all the fun the kids had while we killed some days before driving down to camp, Husband and I had the most fun hanging out with some favorite cousins who have just returned to Austin from a year in San Miguel de Allendre. There were some funny times, we played a little euchre and learned a new card game, Mao, the hard way – or? The way it is supposed to be taught. I still have no idea how to play the desperado, but I can sparkle my fours thankyouverymuch. 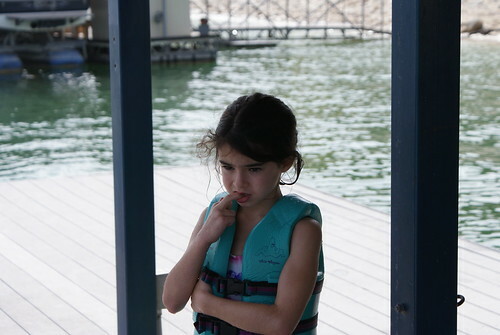 The highlight was finding out Swimmy not only went out on the boat, but jumped in the lake. This may not seem like much, but for a girl that thinks and re-thinks the type of jello she may choose at lunch, this was a Big Deal. 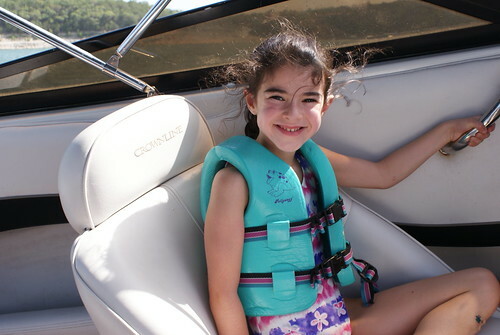 She loved the boat and the lake. LOVED. 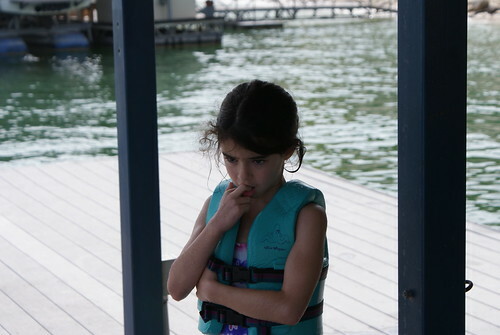 We couldn’t get her on skis, a tube or a waverunner, but there’s always next time. And I know this will be a trip she’ll remember for years to come. 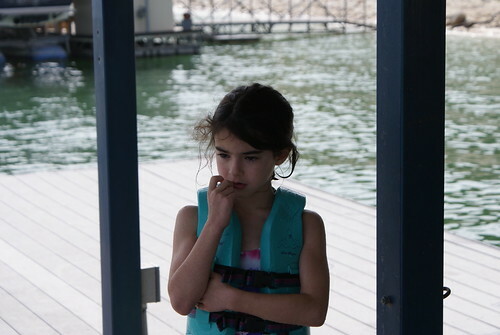 But here are a few pictures of her considering the waverunner. Yeah, not happening. But here she is on the boat. We took her to camp Sunday and while we were a little rushed to get her organized before lunch, she settled in nicely. She knew another little girl from her JCC day camp group this summer and that was a big “WHEW”. Finding out she was assigned to a top bunk didn’t sit well, but another little girl offered to switch with her and everything was great from there on in. I teared up twice while dropping her off. Once was when I walked into the chadar (cafeteria) to grab her at the end of lunch and they were singing the blessing after the meal (a right of passage otherwise known as the Birkat Hamazon – it is long and fun.) It instantly brought back my own camp days – some of the greatest memories I have. The other time was actually turning the corner and seeing her cabin. A cabin I had once stayed in – as a camper and as staff. Before I left I put a little note under her pillow telling her I loved her and saying the blessings we say each night before we go to sleep so that she will have them to say as well. She was nervous but okay when I hugged her goodbye in the middle of the noise and the chadar and as I walked out I sung along with the birkat – smiling all the way. Driving out of those familiar gates I sent a little prayer up to G-d that wished for her a wonderful 10 days and the first brick in a long path of camp memories. 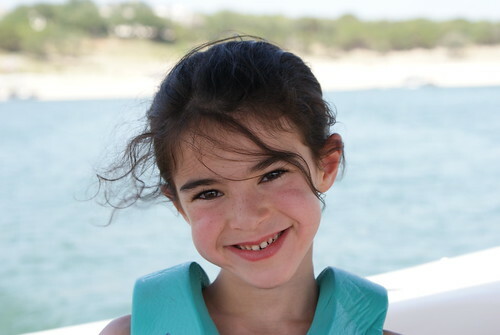 I pray that the experiences she has at camp in years to come are as powerful as they are joyful and that a special part of being jewish settles into her heart forever. And I hope she remembers always to say, “Please HAND me the salad” and not “Please PASS me the salad,” ’cause that last one will get it tossed at you. I hope that she has a WONDERFUL time at camp… it has such a special place in your heart – I’m sure that she’ll love it too! It sounds like you were a trooper leaving her there, I’d have cried all the way out the cabin and through the gates… but then again, I’m a complete SAP! I’m such a bad mom — I didn’t cry.. I just looked forward to next year when ALL my kids are at camp and hubby and I can SO chill out. AND I asked my almost 11 year old dd if she had a boyfriend at camp. She just said “gross! MOM!! !” She probably does. Hopefully he is not gross. Another glass of wine? Wait until you see what you have to do with sevens. and twos. Oh… and nines. Don’t forget to pinata your sixes!